It really is true that project failure is an opportunity to redesign and restart. If you think about it… why do projects fail in the first place? They fail because of some huge flaw that nobody recognized at the outset (or that the stakeholders ignored). So starting over with those flaws corrected is what Henry is talking about. 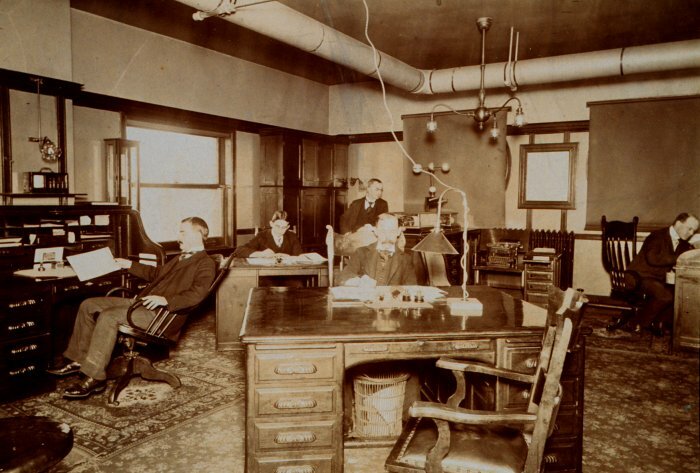 There were 13 years of development leading up to the Model T. (1896 – 1909) There was another 18 years of development that lead up to the Model A. (1909 – 1927) That’s a lot of failure! But think about it… it’s also a lot of success! Actually, not just employees… Everybody avoids the unfamiliar. But this post is about employees, and specifically project team members that engineer or develop new technologies. It’s about how employees sometimes try to settle into familiar tasks and avoid new and unfamiliar ones. And it’s about how to prevent that. But wait… why prevent it? Isn’t efficiency gained by perfecting the familiar? By polishing your craft so you can perform it virtually without thought? Yes, but this isn’t really about that. It’s about the propensity of employees to spend too much time on project tasks they have become familiar and comfortable with, to the exclusion of those upcoming tasks they dread the thought of. I’ve heard reports of engineers racking up 200 – 500% extra time on tasks that could have been completed at the estimated time. Here’s the reason: people become comfortable with tasks they’ve spent significant time on and don’t want to leave them. The next task on their list may be unfamiliar and scary, so they stay on the one that doesn’t give off those vibes. The justification is that the current task could use some more polish. Problem is, you’ve got to keep marching on. Your projects must be completed and delivered. You can’t afford to dally on project tasks you’ve already completed. Here’s a technique you can use to discourage task lingerers. Set your timesheet “percent warning” to 75%. At that time, the task will begin reminding the employee that it’s time to move on. Of course, they may resist, but it’s a good reminder. Then set the “percent error” to go off at 125%. That stops team members from entering any more time. You can extend it with an administrator override, but at least you have some controls to monitor and manage task lingering. Here’s a YouTube video that describes task lingering. Timesheet Administrators: Lock Your Timesheets Quick! Have you ever locked your company timesheet when the week or pay period is over? If not, you’re probably wondering what for? Why lock an employee timesheet? Or you might be wondering how to do it at all. Locking employee timesheets is done for two primary reasons: payroll and client billing. First, payroll: If you use your timesheet hours to pay employees, those hours must be verified and deemed correct before entering them into payroll. Nobody wants to be shorted just because they missed a few daily entries, but it happens. You also don’t want to pay crafty employees twice what they should get, just because they entered 80 hours in for the week. Again, you’ve got to verify and certify before timesheet hours go to payroll. But what happens if an employee makes a change after the hours have gone to payroll? For instance, they realize later that they actually worked a few hours overtime. Understandably, they want to be paid for those hours. But they may not know you have already cut the check. So they innocently enter the extra overtime hours, and nobody notices! The check was already cut before they entered them. Yikes! Locking all the employee timesheets before you cut checks is the only safe solution. In the example above, the employee would not be able to enter his overtime hours for the previous pay period because it was already being processed. Lock it down and they can’t enter any additional hours. Of course, they’ll come back screaming, but at least you won’t miss the hours. Just tell them to enter the hours for next week and they’ll get paid for them in the next check. Second, client billing: It’s the same issue as payroll above. Employees who enter time for the purposes of billing clients may not know the exact time you cut an invoice. The scenario is the same: The Accounts Receivables department cuts an invoice for the previous month’s work… and then a day later one of the employees working on that project enters some additional hours – AFTER the invoice was already cut! The Accounts Receivables department doesn’t realize that more time was added to this invoice date range, and, the employee doesn’t realize that the invoice has already been cut. So the billable hours he entered are effectively lost. Sure, they are in the system, but nobody knows they should be included on an invoice. Again, the safest solution is to lock the invoice date range before cutting an invoice. This prevents any new hours from being entered. Employees will get an error and realize they should put the hours into the next pay period instead. Try locking your timesheets, if you deal with payroll or client billing! PMO’s and project managers, have you ever considered hooking a timesheet to your MS Project MPP file? You spend a good deal of time pouring over your MS Project files, scheduling tasks, and assigning hours, but are you ignoring the ‘Actual Work’ field? Do you have an automated way to input actual work? Hooking a timesheet to the Actual Work field turns your static project schedule into a living, breathing document. You’re now releasing the beast into the wild, and you might be surprised at what it turns into! What, exactly, does that mean to release the schedule into the wild? It means letting employees enter their own actual work against their own tasks. It means hooking a timesheet to your project schedule. 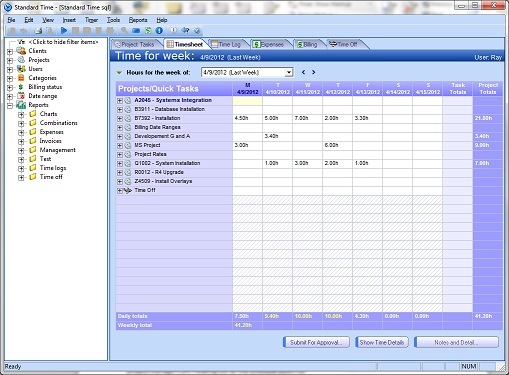 See this timesheet program for an example. Getting actual working hours from employees might completely surprise you. Many project managers are uncertain how long tasks take. They have a good intellectual guess, or even some estimates from the actual engineers on the ground, but actual hours from employees can be a huge eye-opener. They are almost never what you expect. Project tasks often double or triple from their initial baseline estimate. No kidding! And when that begins to happen on a regular basis, panic sets in! You now have to either rein back your initial proposal or force employees to be more efficient. See what I mean by setting the beast lose in the wild? When engineers blow past your estimates, or even their own, they have no particular malice in mind. They are just doing their jobs. They may have no idea how those bloated task hours fit into a larger picture, or how they may affect a static project schedule. Again, they are just doing their jobs to the best of their abilities. And if that means a little extra work, then so be it. Problem is, stakeholders and project managers are freaking out as the schedule blows up. I once heard a manager say, “At this rate, we can only do a quarter of what we hoped.” That’s project management panic! So back to hooking a timesheet to your MPP file… Sure, panic may set in for a while. You may need to rethink your plan. But you’ll be much more educated than if you had left the schedule in an “open loop” system without actual hours from employees. Ignorance is bliss! A timesheet is the best thing ever invented for a project plan. They are so closely related, they should be in the same package! Fortunately, with this timesheet app, they are. In fact, you don’t even need MS Project. You can create your own project schedules with full hierarchy and project tasks, and then track time to them. You’ll instantly compare estimates with actuals, and avert most of the panic associated with a blown schedule. Getting “Actual Work” feedback early is the best answer to project management panic! Time tracking, for the purposes of project management, is an overhead some companies are not willing to undertake. (Read this as an exploitable mistake!) We all know that some level of administrative overhead is necessary to maintain a healthy organization. And some level of process or methodology is also necessary. In this article, I’m suggesting that time tracking should be part of that process. There are three primary reasons to track project time that apply to all organizations. It matters nothing whether your company is a consultancy, manufacturer, government agency, non-profit, or otherwise. Time tracking is valuable to all. Here are the top three reasons to track project time. 1) Reduce budget overruns, 2) Prioritize projects, and 3) Learn your own business. I’ll discuss these three project tracking benefits in detail. Feel free to skip to the ones that interest you most. Human beings are curiously bad with two things: time and money. A huge number of cottage industries are built around helping people manage time and money. Why? Because almost every one of us does it badly. Admit it… your bank account scrapes bottom almost every month. And you’re late for at least one event per month. That’s so easy to predict, I don’t even have to know you to feel confident in its reach. Everyone suffers from the same poor time and financial accounting. Unfortunately, we carry those same poor principles into our work life. I’ll venture to guess that your boss, and his boss above him, is also a poor manager of his personal time and money. Just because he’s a boss, doesn’t mean he’s any better at time management, or money management, than you are. We’re all crap. But if you’ll just subject yourself to a little time tracking discipline, you can avert the most common budget overruns. It’s the low-hanging fruit you’ve heard so much about. Just track the time you spend. That time translates into salaries. Now you know the project cost. Don’t spend more than you take in. Simple. I know a great time tracking product for this. It’s named Standard Time. Click here for Timesheet and Time Tracking Software. You can install this on everyone’s workstations, and start tracking project time. You’ll see why it’s important in the next two reasons to track time. “Secondary projects” are nice to do when you’ve got time and money to burn. Have you got time and money to burn? If not, you must focus on the strategic projects. They’re the only ones that make money and keep people employed. And how, exactly, do you do that? You track time to them! Collect all your hours for every project you work on, and then run a report that shows you which projects are getting the most time. You might be surprised! Even better, categorized your projects as “strategic” and “non-strategic” and run the report again. Which category is getting the most time? Are you surprised yet? If you’ve already downloaded Standard Time (see link above), you can get all these reports for free. When you track time to company projects, you learn what makes them efficient, and what makes them inefficient. You learn the gritty details because you see everything that goes into the work you do. My advice: pour over the descriptions in every time log entered by every employee. Submit yourself to the excruciating pain of studying these details. You’ll perfectly hate it! But even as you hate it, you’ll love it. You’ll become an expert on your business and will soon have the information you need to make improvements. Time tracking provides the information you need. Microsoft Project as a simple method to find out which tasks are driving the ‘Start Date’ for a selected task. These are called “Task Drivers.” In other words, predecessor tasks that affect successor tasks. Here, you can see that “Task 1a” drives “Task 2”, even though “Task 1b” is also a predecessor. Task 1a is a “Task Driver” to Task 2. Here’s an old saying, “If you want something done, give it to a busy person.” There is a particular commonality among busy people: they complete an astonishing number of tasks each day. Busy people feel they have to complete each and every task given to them. Plus, they feel they need to do every one of them well. Nothing is half-baked. No detail is too small. But to a busy person, all that work is not a burden, it’s an investment. But still, they sometimes feel overwhelmed but keep motoring on day after day, doubling the number of tasks that normal people complete. They rarely wait for someone to tell them to do a task twice, or even once for that matter. I’ve noticed that busy people even walk faster than normal people. They seem to be on a mission everywhere they go, even to and from work. They drive faster and rarely make “quick stops” along the way. They never say, “I’ll just be two minutes,” which has become a popular saying of the non-busy people of the world, because it’s never really just two minutes is it? I admire busy people, and enjoy studying them, especially in the project management setting. You don’t see them in meetings like the non-busy people. Instead, they’re heads-down or jetting off to the next task. That’s a discipline few possess, including myself. Bottom line: if you don’t have a busy person to emulate, try becoming one yourself; someone might being to emulate you. Prioritize everything, all the time. Complete every task. Grind out the details that most people gloss over. Get a whole day’s work done by 10 AM, and then look for something else to do. You might just find that the busy life suits you!